A top U.N. official condemned a kamikaze rebel attack on Sri Lanka's capital and urged both sides in the nation's civil war to avoid a "final bloodbath." 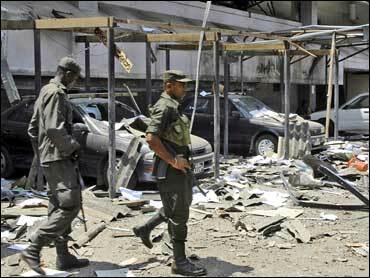 Hours later, suspected Tamil separatists killed eight people in a shooting and stabbing attack. The surprise suicide plane attacks in Colombo late Friday killed four people - including two rebel pilots - and embarrassed the government, which only two weeks ago claimed it had effectively grounded the Tamil Tigers' small force of light aircraft by seizing all rebel airstrips. The attacks also signaled the Tamil Tigers were not ready to give up their fight for an independent state for minority Tamils despite an unrelenting government offensive against the rebels' heartland in the north. In a separate attack, suspected rebels stormed a village Saturday evening near the eastern Sri Lankan town of Ampara, shooting and stabbing to death six civilians and two police officers, the military said. Rebel officials could not be reached for comment. That attack highlighted fears that the rebels, who were driven from their eastern strongholds two years ago by the government, maintained the ability to carry out guerrilla attacks at will. The military has vowed to crush the group and end the 25-year-old civil war. Government forces have driven the rebels out of much of their de facto northern state in recent months and trapped them in a tiny sliver of land along the northeastern coast along with tens of thousands of Tamil civilians. Reports of high civilian casualties in the conflict have spurred international observers to speak out. Human Rights Watch said Friday some 2,000 noncombatants had been killed and accused both sides of war crimes, calling on them to immediately stop "the ongoing slaughter of civilians." U.N. humanitarian chief John Holmes (left) said Saturday the U.N. was afraid for the civilians trapped in the shrinking war zone. "I fear the reality is that significant numbers of people are still killed and injured every day in that pocket," Holmes said at the end of a three-day trip to Sri Lanka. Holmes, who met top government officials and visited displacement camps south of the fighting, said not enough food and other aid was reaching the trapped civilians, and he raised concerns about the heavy military presence at the camps for the more than 30,000 civilians who have fled the war zone. He promised the U.N. would send $10 million in emergency aid for food, medicine, shelter and other necessities for the displaced civilians, and urged both sides to ensure an orderly end to the conflict. "What we need to avoid is a final bloodbath, if you like, at the end of this process that could be dreadful for the civilian population as well as for the future (of the country)," Holmes said. The government has repeatedly denied targeting civilians in the fighting and Human Rights Minister Mahinda Samarasinghe said its policy was to ensure civilian safety. Holmes denounced the Tamil Tigers' suicide plane attack and expressed condolences for the victims' families. At least 51 people were wounded in the attack. Authorities pulled the wreckage of one plane out of a government high-rise office building near air force headquarters in the middle of Colombo. The second plane crashed near an air force base just outside the international airport north of the city. The rebels said the pilots were on suicide missions targeting the air force installations, that they crashed intentionally and that the raid was a success, according to the rebel-affiliated TamilNet Web site. Air Force spokesman Wing Commander Janaka Nanayakkara confirmed it was a suicide attack, but said anti-aircraft fire forced the planes to crash before they reached their targets. The aircraft that crashed near the air force base was packed with 287 pounds (130 kilograms) of high explosives that did not detonate, he said. The other exploded after crashing into the tax office, though it was unclear what explosives were aboard, he said. The Tamil rebels have launched several air attacks aimed at boosting morale and humiliating the government. The latest raid showed the rebel movement "retains its capacity for surprise unconventional warfare," political analyst Jehan Perera said. However, their willingness to sacrifice two precious aircraft from their tiny air force could signal they were nearing the end of their fight. "We knew they were desperate, we were expecting these kind of a suicide attacks ... and we were prepared," military spokesman Brig. Udaya Nanayakkara said. The rebels were believed to have three or four light aircraft, but Udaya Nanayakkara said he didn't believe the group had any more planes left. The Tamil Tigers have been fighting for independence since 1983 after decades of marginalization by the Sinhalese majority. More than 70,000 people have been killed.